Do you have to write an essay, a report, or something else? It can be tricky to know where to begin – so let's start with the basics. Try our activities on types of academic assignment, a quiz on question words, an explanation of structure and more! What type of assignment do you have to write? You've been set your assignment and you've got to start writing – or have you? There are a number of different types of assignment that you might have to write. The first thing you should do is make sure you know WHAT you have to write – is it an essay, report, literature review, or something else? Read on to find out what you need to do with academic writing. Read about four different types of written assignment and check you understand their particular characteristics. We'll test what you've learned further down this page. The main purpose of an essay is to make an argument. As such, essays need a clear structure and good research. They’re often longer pieces of writing. Reports are written to present research and analyse findings. They contain particular sections such as an abstract – which is a summary of the findings, and a methodology section – which details the research methods used. Reports tend to be more impersonal and objective than essays. They are more common in sciences and business courses than humanities. These are written to systematically review academic materials on a particular topic (‘the literature’). They are often used to identify gaps in what has already been written by the academic community. 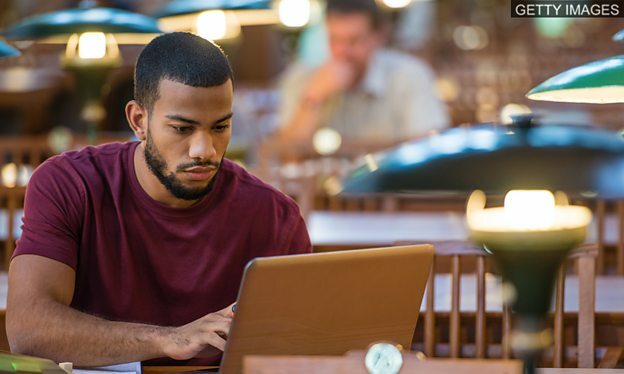 These involve writing brief answers to one or several questions, which are designed to test subject knowledge and information-processing skills. They’re often done as regular homework or exams, rather than as longer pieces of work. 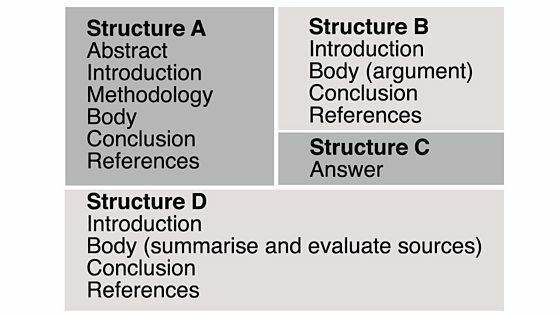 Match these four types of written assignments with the structures displayed in this image. Match the assignments types to the example structures. That's right! It's a short-answer assignment. Answers can be brief and less obviously structured, but they still need to be well written and relevant to the question. Sorry, that's wrong. You need an assignment type that isn't very long. That's right! It's a literature review. It is similar to an essay, but the purpose of the main body here is to systematically summarise and evaluate the source material. Sorry, that's wrong. You need to find the assignment type that focuses on summarising and evaluating sources. That's right! This structure in an example of a report. It contains an abstract and methodology, which are not usually present in other assignment types. Note that the abstract is often written last, as you need to finish the main report before you can summarise it effectively. Sorry, that's wrong. You need the assignment type that includes an abstract and methodology section. That's right! It's an essay. This structure appears similar to a literature review, but we know it’s an essay because the main body of the text puts forward an argument. Sorry, that's wrong. Look closely to find the assignment type where an argument is presented. You've got the structure sorted – now it's time to take a look at what you have to do in different written assignments. Go to the next activity page to find out how to make sense of question words.